1) Practice the Right way, Practice, Practice, Practice, Practice, Practice…..
Is this a common scenario at home? I have been overlooking this poor habit of hanging in the boys’ room. Didn’t want to nag. Decided to finally make an effort to address this long messy issue. 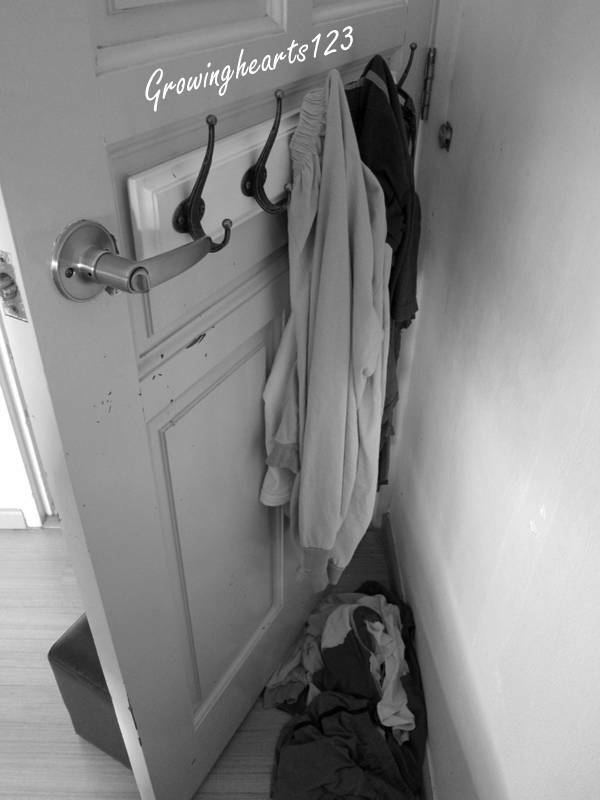 One day, I sat down on the stool at the door and made each of my kids pick up every piece of their crumpled clothes. They had to practice hanging each piece 10 times. So in all, they spent 10 to 15mins just hanging the item, removing and putting it on a chair, then hanging it nicely again before removing etc. You get the picture. All 4-8 items. The thing is, I need to be prepared to spend that time to follow through their actions each time they forget. I figured it’s worth it in the long run. But I need to remember myself and be consistent till they are weaned off from the poor habit and be renewed in the good. 2) Using Relevant Consequences to Mete Out the ‘Offense’. I found my daughter’s room being vandalised. Who’s the culprit? None other than herself. This was not her first time. 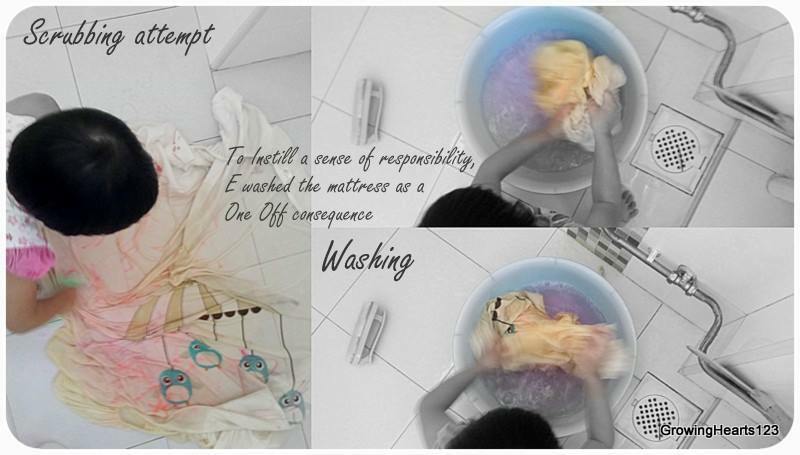 This time round to instill a sense of responsibility, I decided to let her not only clean up the marks on the floor, but also try washing off the stains she had done on the bedsheets herself. At the end of the day, it doesn’t matter if her room is stainless (trust me, am no neat freak myself ; p ), what matters is the heart to learn how to respect properties. Especially outside of home. For more ideas on practical consequences for undesired actions, read Eggcellent Eggxample of Restitution. Previous Minibooks within a DIY Big Book? What’s that? Next Am I in Danger of Being the Prodigal Son’s Elder Bro? They say “practice makes permanent”. 🙂 Thanks for this post to remind us to not give up on letting them do things for themselves, and to just keep practising! I agree with you, they need to learn actions lead to consequences! Good idea to let them clean up their own mess. I shall try it out on my kids too. haha.. Though it does require more time and energy plus whole lot of patience to let them do it. : ) Let’s jiayou!